Figure 1. The field team poses for a photo at Bako National Park. 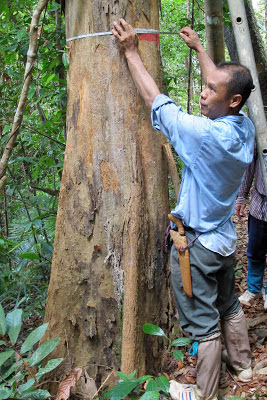 At the end of April 2013 I left behind my fieldwork on flowering times in Concord, MA and flew across the Pacific to re-connect with my old research project in the rain forests of Sarawak in Malaysian Borneo. 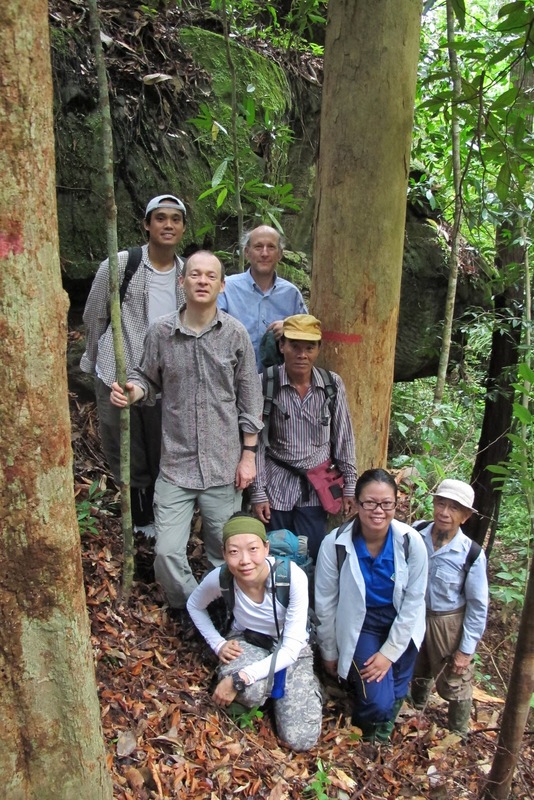 A little background information is necessary first: In 1965, Prof. Peter Ashton (now a retired Harvard professor) and the Sarawak Forest Department established permanent research plots in primary forest to investigate factors affecting tree species diversity. These forests have exceptionally large numbers of tree species, with many of the biggest trees belonging to the economically important dipterocarp family. In the 1980s and early 1990s, my students and I helped in the 5-year re-censuses of plots at Bako National Park and Lambir National Park, using the data to calculate growth rates and mortality rates of trees which we could compare with nearby selectively logged forests and tree plantations. Presently, these forests are being re-censused by scientists from Leeds University in the UK and the Center for International Forestry Research in Indonesia and local forestry workers to gain insight into the impacts of climate change on tropical forests: Are trees now growing faster due to the fertilizing effects of higher atmospheric levels of carbon dioxide? Or will trees have a slower growth rate and increased mortality rate due to higher temperatures and increased drought stress? My key task was to show them how we took measurements in the past, so they could replicate our methods. 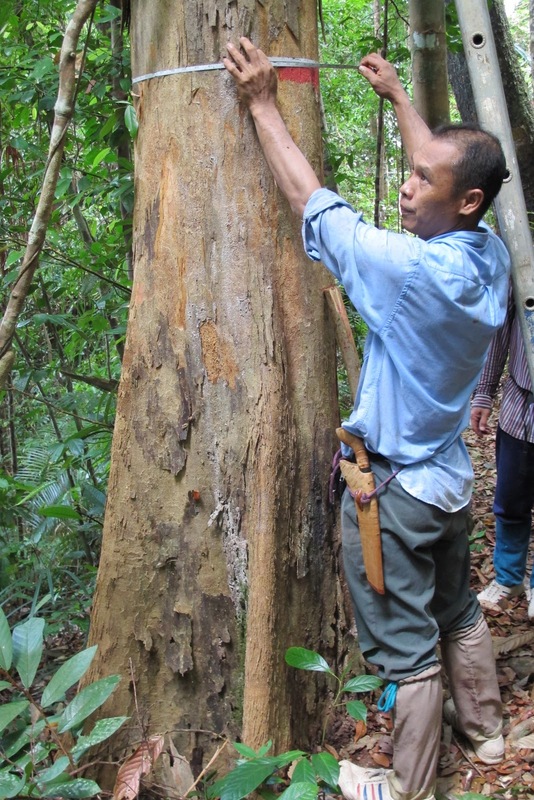 The results of the current study will affect ongoing governmental and scientific discussions about the value of tropical forest conservation in lowering atmospheric carbon dioxide levels. The study also illustrates the importance of well-documented, long-term studies to address contemporary issues. Figure 2. Field biologist takes a measurement of tree diameter at a painted point. Note that this measuring point has been moved up to about 2 m to avoid buttresses. 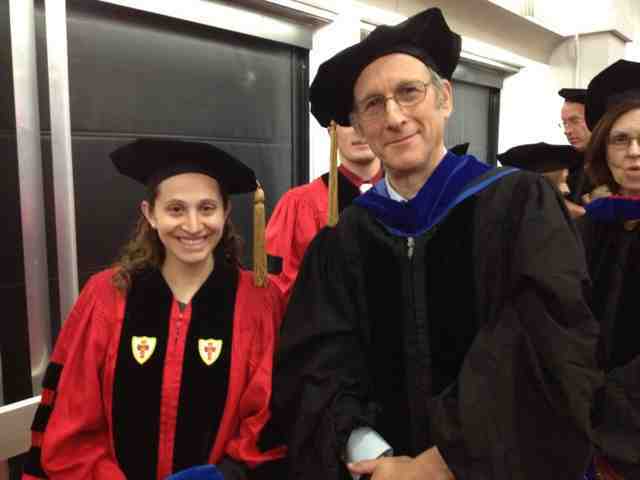 Today Dr Caroline Polgar was hooded by Dr Primack at the BU hooding ceremony! Caroline defended her dissertation on the effects of climate change on spring phenology last autumn. All of the students who received a PhD from the graduate school of arts and sciences this year were ceremonially dressed in hoods matching those of their academic advisors. Dr Primack and the dean of arts and sciences hooded Caroline. Congratulations, Caroline! One of the major tenets of the Primack Lab is an emphasis on communicating our research beyond the scientific community. From the Concord Museum to the pages of the New York Times to this very blog, we are committed to public outreach and education. Following in this tradition (and inspired by our newly minted lab blog!) I applied for an Ecological Society of America Graduate Student Policy Award, and then I blogged about the experience. 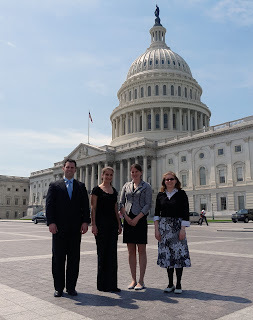 The opportunity to travel to Washington DC for two days and talk science, policy, and research funding with ecologists and Congressional staffers was amazing. Every time I entered a Congressional office, I talked about my work studying the effects of climate change on plant communities in Acadia National Park, the importance of ecological research, my experience as a graduate student whose funding had been sequestered on March 1, 2013. And, when I returned home, the opportunity to blog about this trip at Early Career Ecologists was truly icing on the cake. Read an excerpt below & click through for the full post! In April, I had the honor of visiting the Congressional offices of my home state Massachusetts to lobby on behalf of science funding. I spent Monday morning tromping between snow drifts off the coast of Maine, but by Tuesday evening I was wandering under cherry blossoms along Washington DC’s tidal basin in a T-shirt. I was a week into my field season monitoring flowering phenology in Acadia National Park, but I had traded my down jacket and LL Bean boots for a pencil skirt and pumps, hopped on a tiny eight-seated Cessna at the Bar Harbor airport, and flown to Washington DC as an Ecological Society of America (ESA) Graduate Student Policy Award recipient.